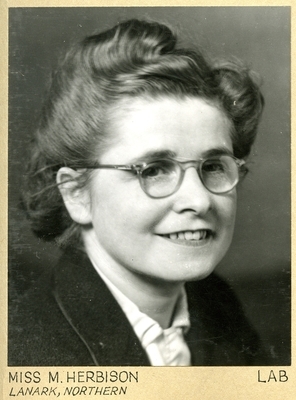 Peggy Herbison who came from a Lanarkshire mining community and a family committed to Labour politics, formally began her political career as MP for North Lanark in 1945. Five years later she achieved ministerial office as Under-Secretary of State at the Scottish Office, and went on to become Minister of Pensions and National Insurance (Social Security from 1966) in Harold Wilson’s Labour Government in 1964. While in post she abolished the means-tested national assistance scheme, so loathed by the left, and replaced it in 1966 with Supplementary Benefit that operated until 1988. She was a member of Labour’s National Executive from 1948-60 and party Chair from 1956-7. In July 196,7 she resigned office in protest at the government's refusal to increase children's allowances. In the House of Commons, she was Chairman of Select Committee on Overseas Aid in 1969-70 but retired from parliament at the general election in that year. She was also voted Scotswoman of the year in 1970. In 1970-71, she was appointed Lord High Commissioner to the General Assembly of the Church of Scotland, the first woman to hold the office. Born 11 March 1907, Scotland. Margaret McCrorie (Peggy) Herbison (1907-1996) was a graduate of the University who became a Labour politician and Government minister. She was awarded an honorary LLD in 1970. 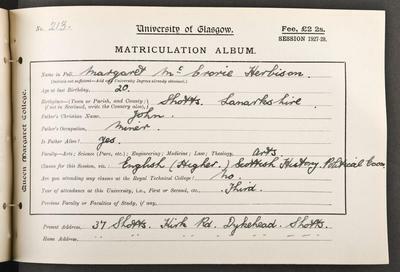 Born in Shotts, Herbison studied English at the University and was chair of the Labour Party branch. She graduated in 1928, MA with Honours and became a school teacher. In 1945 she was elected MP for North Lanarkshire, was elected to Labour's National Executive Committee in 1948. She was Minister of Pensions and National Insurance (which post was renamed Social Security in 1966) from 1964 until she resigned office in 1967. She retired from politics in 1970. Herbison was a member of the Church of Scotland, and in 1970 she was the first woman to be appointed Lord High Commissioner to the General Assembly. Dalyell, Tam. Herbison, Margaret McCrorie [Peggy] (1907–1996). Oxford National Dictionary of Biography. As Minister of Social Security, Margaret Herbison abolished the National Assistance Scheme and introduced Supplementary Benefit. World Changing Project, "Minister of Pensions and National Insurance 1964-1967," in University of Glasgow World Changing (University of Glasgow, 2010); http://www.worldchanging.glasgow.ac.uk/article/?id=85 (accessed April 26, 2019). World Changing Project. "Minister of Pensions and National Insurance 1964-1967." In University of Glasgow World Changing. University of Glasgow, 2010. http://www.worldchanging.glasgow.ac.uk/article/?id=85 (accessed April 26, 2019). World Changing Project. "Minister of Pensions and National Insurance 1964-1967." University of Glasgow World Changing. University of Glasgow, 2010. 26 April 2019 <http://www.worldchanging.glasgow.ac.uk/article/?id=85>.